Prickly pear fruits (sabras) make a delicious and naturally colorful syrup. Of course, you can use this syrup on top of pancakes, but it is also wonderful for cocktails or as the base for a granita or sorbet. 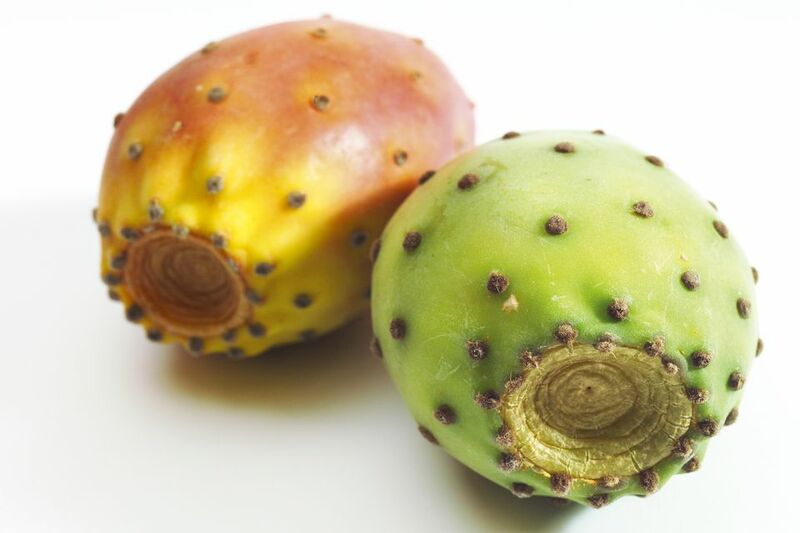 Prickly pears are the fruits of Opuntia cactus plants. Their tasty pulp ranges from a gorgeous saffron gold to a rosy magenta color, and they make a wonderful syrup. If you purchase prickly pear fruits, they will already have the notorious prickles (technically called glochids) removed. Even if you buy prickly pears, it's a good idea to wear gloves just in case there are still a couple of glochids present. Use a paring knife to peel the fruits and discard the peels. Prickly pear fruit is very seedy, but for this recipe, you don't have to deal with the seeds at all. Coarsely chop the pulp and put it into a large pot along with enough water to cover the fruit. Bring to a boil over high heat, then reduce the heat and simmer until the fruit pulp is losing its color and flavor to the liquid, about 15 minutes. Strain the liquid through a jelly bag, several layers of cheesecloth in a colander, or a cloth produce bag. Measure the strained liquid. You should have about 4 cups. Return the prickly pear liquid to the pot (wash the pot first if there are any seeds sticking to it). Add the sugar and lemon juice. Bring the mixture to a boil over medium-high heat, stirring to dissolve the sugar. A foamy scum usually forms on the surface of the prickly pear syrup while it is coming to a boil. Skim as much of this off as possible and discard it. Screw on canning lids and process in a boiling water bath for 10 minutes (adjust the canning time if you live at a high altitude). Alternatively, skip the canning process and refrigerate your prickly pear syrup for up to 1 month. You can reduce or increase the amount of sugar to taste, but do not decrease the amount of lemon juice as this adds acidity that is essential to preserve the syrup.